Scroll down to find the ministry that you would like to learn more about. For information about specific events, go to our Calendar page. This is an unstructured service in which various men share a Scripture, a reflection, a hymn or a prayer. Our focus is the death and resurrection of Jesus Christ. This service culminates in taking the bread and the wine in remembrance of him. 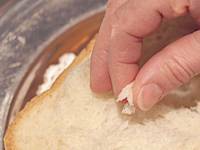 In some Christian traditions, this service is called "Communion" or "The Lord's Supper" or the "Eucharist". This service is similar to what most evangelical churches would call their worship service or their Sunday morning service. We sing worship songs reflecting a variety of musical styles. 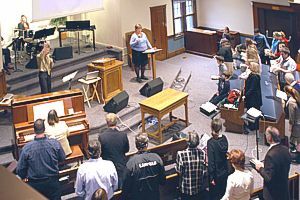 Some are led by a worship team and others are older hymns accompanied by the piano. There are often Scripture readings and prayers, followed by a sermon of about 30 minutes. The preaching is done by a wide variety of men from the church as well as some who attend other churches. This provides room for different styles, experiences and tastes in the preaching ministry. Our Sunday School is a busy place for children aged 3 to 15. Our teachers are dedicated to helping our youth learn more about Jesus, deepen their faith in Him and strengthen their Christian walk. Children go to Sunday School after the worship portion (about 15 minutes) of the Family Bible Hour. A Life Group is a group of about 12 individuals who meet together to worship, pray, and to learn from one another as we study God's Word together. Most life groups meet on Sunday evening at 6:00 or 6:30 in various homes throughout the city. This year, we have five life groups meeting in a variety of homes. Life Group leaders are Dave and Gloria Kidney (West End) , Barry and Cheri Kirk (Chapel), and Jim Howlett and Lydia Cartlidge (East End). Tuesdays @ 6:30 at the chapel. Kids enjoy playing games, making crafts, signing songs and learning Bible stories. Tribe is a wild time of fun and excitement for students in grades 6 to 8. Our Thursday evenings include some frantic games, a story about Jesus, small group discussions and a fun activity. A group of women of different ages and life situations meet together to study God's word, pray and encourage one another in their faith. For students in grades 8 - 12, this group meets on Thursday evenings at the chapel.